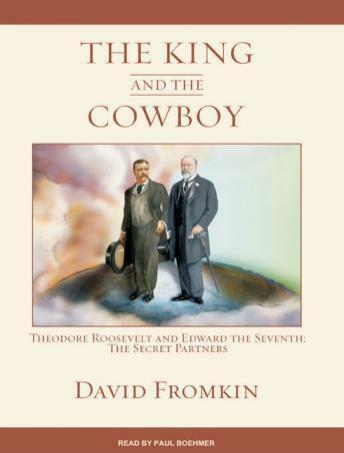 In The King and the Cowboy, renowned historian David Fromkin reveals how two unlikely world leaders-Edward the Seventh of England and Theodore Roosevelt-recast themselves as respected political players and established a friendship that would shape the course of the twentieth century in ways never anticipated. In 1901, these two colorful public figures inherited the leadership of the English-speaking countries. Following the death of his mother, Queen Victoria, Edward ascended the throne. A lover of fine food, drink, beautiful women, and the pleasure-seeking culture of Paris, Edward had previously been regarded as a bon vivant. The public-even Queen Victoria herself-doubted Edward's ability to rule the British Empire. Yet Edward would surprise the world with his leadership and his canny understanding of the fragility of the British Empire at the apex of its global power. Across the Atlantic, Vice President Roosevelt-the aristocrat from Manhattan who fashioned his own legend by going west to become a cowboy-succeeded to the presidency after President McKinley's assassination in 1901. Rising above criticism, Roosevelt became one of the nation's most beloved presidents. The King and the Cowboy provides new perspective on both Edward and Roosevelt, revealing how, at the oft-forgotten Algeciras conference of 1906, they worked together to dispel the shadow cast over world affairs by Edward's ill-tempered, power-hungry nephew, Kaiser Wilhelm II of Germany. At Algeciras, the United States and major European powers allied with Britain in protest of Germany's bid for Moroccan independence. In an unlikely turn of events, the conference served to isolate Germany and set the groundwork for the forging of the Allied forces. The King and the Cowboy is an intimate study of two extraordinary statesmen who-in part because of their alliance at Algeciras-would become lauded international figures. Focusing in particular on Edward the Seventh's and Theodore Roosevelt's influence on twentieth-century foreign affairs, Fromkin's character-driven history sheds new light on the early events that determined the course of the century.